Recently, I made an “extra” $1,000 off a one-time gig. The earnings were completely unexpected and in addition to my regular, average income, which is why I’m considering it extra cash. If you’re anything like me, whenever you have extra money on hand the ways you could spend that cash quickly add up to more than you actually have. There’s always a choice to be made. And that can be difficult, as I feel there’s a lot of pressure to ensure $1,000 doesn’t go to waste. So I’m trying to narrow down the options and choose the smartest place to put this bit of extra income. Here are the ideas I’ve come up with so far — but I’m curious to know, how would you spend $1000? Don’t Spend It; Save It Instead! Of course, my first thought was, “save it!” I don’t have any big expenses coming up, but why not give my emergency fund a boost and give myself an additional $1000 cushion for when I am faced with a major cost? After all, my car is creeping up on 100k miles, one of our house’s A/C units might be older than I am (and it’s obviously a miracle that it’s still running right now), and with pets there’s always a chance a big vet bill is looming around the corner. Or I could add $1000 to our travel fund. We’ve set a goal to take one big international trip per year, and do accomplish this we need to regularly add to our savings for things like plane tickets. Speaking of travel, would you spend $1000 to take a trip now? I’m certainly tempted. That wouldn’t cover another trip abroad this year, but it would definitely cover the cost of a relaxing vacation like a week down at the beach or even a cruise. And after working really hard this year to quit my job and pursue self-employment full-time, taking a “free” vacation where I can sit back and do nothing sounds like a lot more fun than it used to! Another option for the $1000 would be to invest it. I could add it to current investments — which would be index funds — or I could get totally wild and crazy and pick a few stocks on my own. I wouldn’t “play” with what we regularly contribute to investments like this. I don’t try to time markets or pick stocks because I know that’s a losing proposition when you’re investing for the long-term. But it would be kinda fun to try my hand and choosing the next big thing with a little bit of extra cash. Or, I could even make about two extra mortgage payments, but I’m not sure what the point would be here. We’re not in a hurry to repay our mortgage thanks to a crazy-low interest rate. I’d probably make more in the market (even picking my own stocks!). Still, it’s a thought worth considering, seeing as it would be that much more knocked down off the principal. I think spending the extra cash — when I don’t need to spend it — is a little financially irresponsible. But I’m also extremely forward-thinking and tend to focus on the future at the expense of today, and that’s a bad habit I’m working to break (a little). Life is all about balance, so it’s certainly not a crime to spend extra money right now when we have an emergency fund, no debt beyond that low-interest-rate mortgage, and are already in the habit of investing a large percentage of monthly income. The key to spending my extra cash would be to do so in a way that was smart, and could still be considered an investment. For me, that would be spending it on home improvement projects that are likely to bring up the value of the property: new hardwood floors downstairs, new countertops in the kitchen, a front-and-back-yard overhaul… lots of options here. These are the ways that I’m considering using an extra $1000. But I’m curious: what do you think of these options? 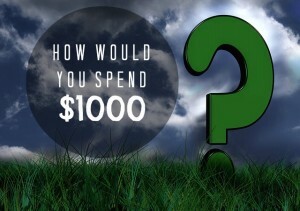 How would you spend $1000 if it was extra cash that needed to be put to good use? This makes it really easy when extra money comes in. I just apply it to the first goal that isn’t done yet, which has mostly been my mortgage all year. The last few paychecks have gone to stockpiling a bit more cash since I’m planning on switching jobs in the next few months and taking some time off. But once things stabilize again, then I’ll throw any extra cash on hand at the mortgage. A lot of people think I’m crazy for paying down my mortgage rapidly, but I think it’s worth it and I’ve paid off just under 50% of the original balance in the first two years or about $133,000! I like the idea of writing out goals and working down the list! I may need to do that to see what our priorities really are, then take care of those 🙂 Thanks for the great idea! I’d personally spend it on travel to visit family. I am a plane ride (or 12+ hour drive) from my nearest family member, so a bonus trip to see them, or to fly them to me, would jump to the top of my list. If you’re close to all your family and friends, then a vacation to invest in quality time for you and your SO would also be money well spent. I’d probably save it. We are looking to buy a new house (and sell our current one) in the next few years, and we are trying to build up our savings before then. I think that’s smart, Michelle. We’d like to sell our house as well in the next 3-5 years, so it’s probably a smart move for us to start building up more cash savings as well before that event. I always skim off a little for splurging (especially from unexpected money – if you can treat yourself to a little loving then, when can you?) and then invest/save the rest like a nerd… And when i say “skim a little” I mean like $40-$50. I can’t stomach more than that without starting to feel bad, haha… Man us bloggers are lame. I completely understand! I think my idea of skimming off the top would look about the same. Just a little bit — otherwise I’d feel bad about “wasting” money that could be saved/invested. I agree with J Money in taking a bit to treat yourself if you do decide to go the save/invest route. A relaxing vacation sounds really nice right about now, as we’ve been trying to plan a little frugal weekend getaway in a few months. It would be awesome to go all out on a week away somewhere, though. All of this, of course, if I didn’t have student loans! If we do decide to take a trip, we’ll probably still try to make it a frugal one. I don’t think either one of us could just blow any amount of extra cash on an unnecessarily lavish trip without feeling guilty about it and getting a little buyer’s remorse at some point! I would save half and spend the rest of a little treat like a vacation or some very much needed winter clothes. I think skimming a little off the top, as other commenters have suggested, is sounding more and more like the way to go 🙂 I definitely would love to boost our savings — but I think using some as small treat, like you said, is deserved! I think I would spend my $1,000 by saving 80% of it and spending 20% on something I need or “want”. Saving the majority doesn’t make me feel guilty and I also get to spend a little bit of what I made. Great idea, Alexis! I really like this — I was thinking splitting it up was the way to go, after reading everyone else’s comments, and I love your suggestion as to HOW to do the splitting 🙂 80/20 will be a great rule of thumb to use. Thanks! I would pay some of my debts and put it on my saving fund. Right now, I’m working on to build my emergency fund and my savings fund. Awesome goals! Adding more to an emergency fund is never a bad idea. I am always in the camp of you were doing OK before you got it, you don’t need it now. Just bank it. Good point, and true! I think the plan is to bank the majority of it and take a little bit for a small splurge. Pay me to write some guest posts for you. Ha ha! Help a fellow blogger out. This is a good problem to have indeed. I’m really boring. It would go into our bank account and be used for spending or saving just like all the rest of our money. I will spend it with my family. I will treat them like eating in a restaurant; buy some toys and new clothes for the kids and myself. And save some if there’s money left. Thanks for sharing this article. I had fun reading this. Sounds like doing a little bit of both — saving and spending — is the approach favored by most 🙂 I’ll probably end up doing just that. I think we’ll save most of it but hold a little extra out to have some fun with!